Kevin was a young man enjoying his college life when a car jumped the curb and crippled his body. Unable to support himself and dependent on others to meet his needs, Kevin was slipping into depression when his best friend convinced him to play a new game called Genesis Online. The concept was simple: a revolutionary artificial intelligence controlled the game world and adapted it to the actions of the players. Even the developers didn’t know what course the game could take as it evolved. 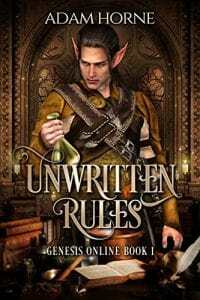 Lured into the game by the prospect of earning real money, Kevin soon runs afoul of a man determined to control as much of Genesis as possible. He recruits other disenfranchised players to his side in his quest to find a way to prosper in the game. Can they stop the man who calls himself the king of Genesis from taking over everything?